Without a speck of chilli in sight (thank goodness) I received this extremely cute package of chocolate spoons from Vanilla Chilli chocolates. Two white and two milk chocolate spoons with a small pack of marshmallows each came through the post and they went straight into milk at the office (I am the milk monster drinking all the milk… me and all the people making lattes in the new machine). I heated 250mL of milk for 2 minutes in the microwave and I stirred the spoon into the mix. Of course, I needed an additional metsal spoon as the chocolate spoon melted to a handle and I needed to dip it in and finish stirring. 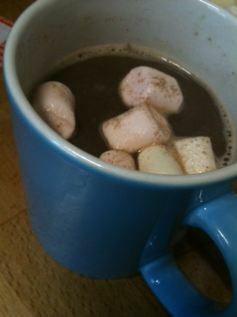 Hopefully you can see I stirred it well and then after I felt it was all mixed in, I added the marshmallows. The white chocolate was sweet and mostly tasted to me like a hot vanilla milkshake, which I know for some if going to be perfection in a mug, but it wasn’t my favourite. The milk chocolate was again sweet but quite chocolaty, so much more for the person into their cocoa solids. The milk chocolate though was though somewhat surprisingly a good quality, so there was a nice chocolate flavour with the spoon on its own, though is was slightly softer than normal chocolate. Not something I’d recommend (eating it without making it into a hot choc). 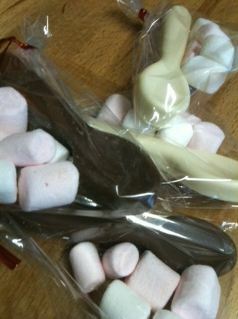 Overall – I liked the separate bag of marshmallows with the cute spoons made entirely out of chocolate. It would make a fun gift and it is super cute. Not quite to my taste but my taste is not the only one as I well know and you sweet fans are going to love them!